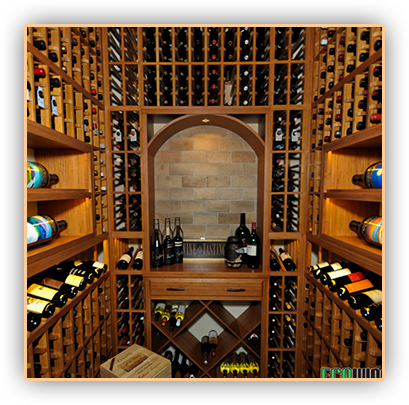 Wine Cellar SPecialists – Award Winning Wine Cellar Project. Award for converting a small kitchen pantry into a fully functional, climate controlled wine cellar. This wine cellar project was created for the Dann family in Frisco, Dallas. The family wanted to transform their underutilized kitchen pantry under the stairs into a custom wine cellars Dallas Texas. The design phase of the project started out with a free 3D illustration provided by Nancy Noga, the owner of Wine Cellar Specialists. 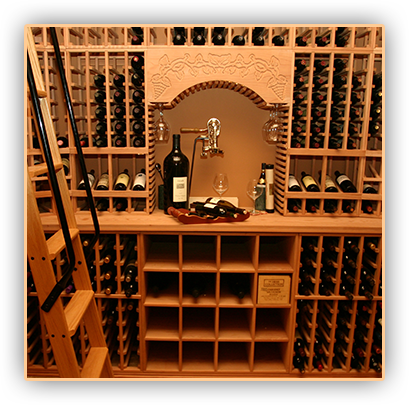 The 3D design provides a preview of what the actual wine closet would look like, as well as outlines the type of racking system. Wine cellar construction began by installing green board interior walls, along with proper insulation and vapor barriers. All these materials are necessary to maintain proper climate conditions for storing and aging wines. The addition of the racking system was the most challenging part of the construction phase. Since the kitchen pantry was located under the stairs, the wine closet had a slanted ceiling. In order to address this architectural impediment, the builders installed a waterfall wine rack that perfectly matched the contours of the ceiling. The waterfall racking system was placed on the left wall of the wine storage room. It has 13 ½ inch depth with 1 ½ inch toe kick and base molding and 2 ¾ inch crown molding at the top. Diamond X storage bins with a horizontal rack above and a little serving table were installed on the back wall. Diamond bins are ideal for bulk storage because they can hold wine bottles of various sizes. Racking systems with horizontal reveal display rows were also installed on the back wall, which allow the collector to showcase his favorite wine labels. A six inch deep horizontal display rack was placed on the right wall near the entryway. 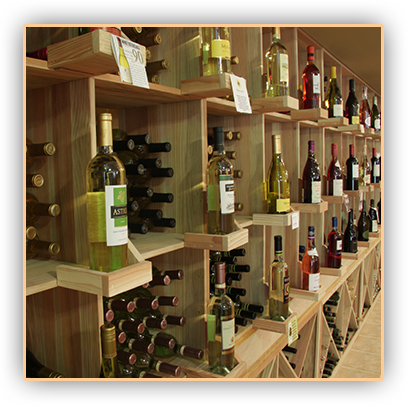 All the racking systems are designed to hold 750 ml wine bottles. The builders used mahogany in constructing the racking system and had it lacquered in order to achieve a beautiful effect. 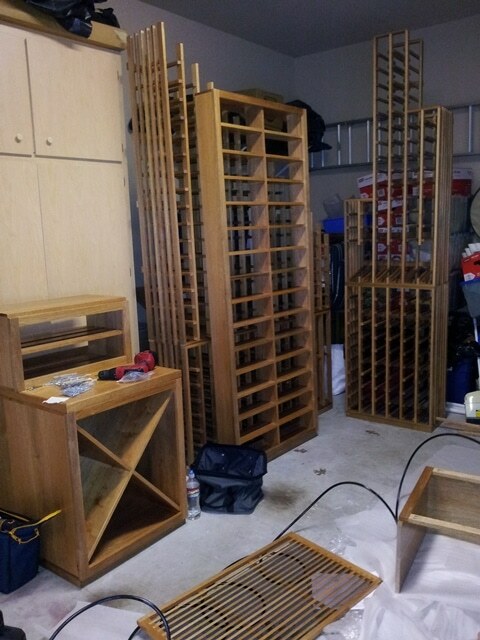 For the cellar entryway, they opted to install a Tuscan wine cellar door which has an automatic bottom feature that helps prevent scratching of the wine cellar flooring. For the refrigeration system, the builders decided to use a US Cellar Systems RM 2600 split systems. In order to hide the cooling unit from view, they built a unique case and grille using the same wood material used in constructing the wine storage racks. 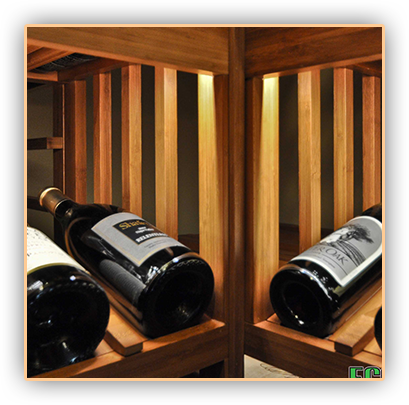 LED based spot lights were used to highlight wine labels and to set the right mood inside the wine closet. Lighting systems that are LED based are ideal for wine cellar use because they produce less heat compared to regular light bulbs. They are extremely energy efficient and are not susceptible to vibration and breakage. The wine closet was originally built to hold 496 wine bottles, but upon completion the Dann family was able to store 514 wine bottles. 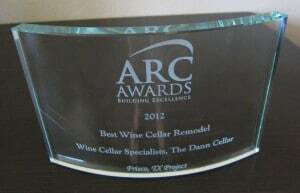 Wine Cellar Specialists is the recipient of the 2012 ARC Award for the Best Wine Cellar Remodel, which is a true testament to their commitment to exemplary design skill and work quality. Click here to read more about this great news – http://www.winecellarspec.com/the-awarded-project-the-dallas-custom-wine-cellars-frisco-texas-job/. 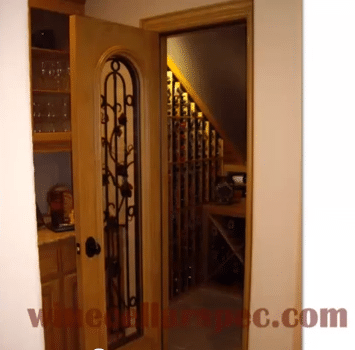 This entry was posted in Climate Controlled Wine Cellars, Custom Wine Cellars Dallas, Wine Cellar Builders Chicago, Wine Cellar Construction and tagged climate controlled wine cellar, custom wine cellars, wine cellar, wine cellar construction by CustomWineCellarsChicago. Bookmark the permalink.